Some of you know I love to play volleyball, and this Crunchy Savory Snack Mix is perfect to share with my teammates between games! It’s nutty, crunchy, crispy, buttery, a little tangy…it’s hard not to eat the whole batch! 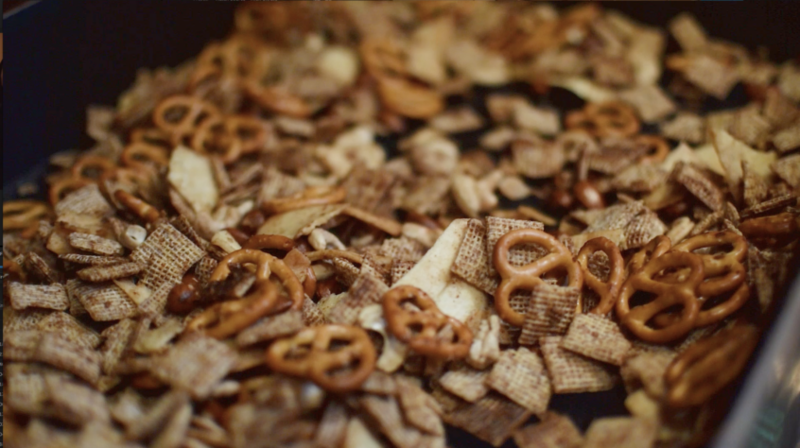 This is similar to snack mixes you can buy at the store, but we make it with wholesome ingredients and you know exactly what’s in it. Take it to your next sporting event! You may know I love to play volleyball, and this snack mix is perfect to share with my teammates between games. It’s nutty, crunchy, crispy, buttery, and a little tangy…it’s hard not to eat the whole batch! 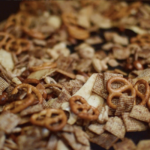 This is similar to snack mixes you can buy at the store, but I make it with wholesome ingredients so I know exactly what I’m eating. Preheat the oven to 250ºF/120°C. Melt the butter in a large roasting pan. Add the Worcestershire sauce, seasoning salt, onion powder, and garlic powder and mix well. Add the rest of the ingredients and mix well, making sure the sauce is coating the mixture evenly. Remove from the oven, spread out the mixture on paper towels, and let it cool to room temperature. Store in an airtight container.